Armed with a menacing body, powerful engine choices and macho attitude, the Dodge Challenger is another modern-day interpretation of a classic muscle car. The 2013 Challenger still trails the Ford Mustang and Chevy Camaro in the horsepower wars, but this large coupe offers more passenger room and everyday practicality. When the battery goes out in the key fob make sure you use a very very high quality lithium battery to replace it or you will have continued problems. I love my car! I wish I had bought the Hemi but I know that would have gotten me in a lot of trouble. I have a Leadfoot and even with it not being the top-of-the-line model with the bigger engine, it performs like all my other sports cars. This is my 2nd Dodge, the first was the Stealth, which was almost identical to the Mitsubishi 3000GT inside. This seems more like a solid American muscle car. What I don't like is it there seems to be some parts of it that are made rather cheaply; for instance the dashboard is separating from the top of the vents. The inside molding of the trunk does not seem to pop back into place the which should and things rattle around in the top of the trunk like when you take a car apart and it is never as and tight as it was when it was new. I wear 4 inch heels everyday to work, and within the first 6 months there was a hole through the floorboard where my left foot set everyday. That's never happened before in any of my cars! Possible that I was a little harder on this car with my left foot as this was my first automatic in 30 years and I was so used to driving a stick that maybe I unconsciously put more pressure down on my left foot the normal. Overall it's a good car and I would consider it again if I ever bought the same car twice. 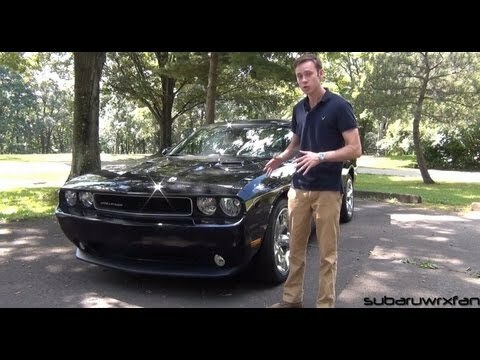 The happy owner of a Dodge challenger. I love my Dodge challenger with the hemi motor. It's a beautiful car. The car has enough torque and power that makes driving a joy. This particular model year, the 2013, has had a few mechanical recalls. One of the recalls, the linkage, ended up causing other problem with the engine. Needless to say, Mopar had a new crate engine. Since I didn't have to pay for the new motor or it being replaced, I am very happy over my car. Maybe a better sound system because I like my music loud. This is the greatest car ever. I love this car so much. I get complimented on it everywhere I go. It is fast, it is comfortable and it looks great. My only complaints are the feature of the windows dropping an inch when the doors are open is a bad design for people who live where it gets snowy the windows freeze in place and makes it hard to close. Also sometimes the directional will turn on before the toggle is fully switched. So it you bump it by accident your directional will turn on. Chrysler (FCA US LLC) is recalling certain 2010 Dodge Ram 3500, Ram 4500/5500, 2010-2011 Dodge Dakota, 2010-2014 Dodge Challenger, 2010-2015 Dodge Challenger, Chrysler 300, and 2010-2016 Jeep Wrangler vehicles. Upon deployment of the driver's frontal air bag, excessive internal pressure may cause the inflator to explode. In the event of a crash necessitating deployment of the passenger's frontal air bag, the inflator could explode with metal fragments striking the vehicle occupants potentially resulting in serious injury or death. Chrysler will notify owners, and dealers will replace the passenger frontal air bag inflator, free of charge. The recall began February 4, 2019. Owners may contact Chrysler customer service at 1-800-853-1403. Chrysler's number for this recall is V01. Chrysler will notify owners, and dealers will inspect the alternator and depending on the part number, will replace the alternator, if necessary, free of charge. The recall is expected to begin on August 24, 2017. Owners may contact Chrysler customer service at 1-800-853-1403. Chrysler's number for this recall is T36. Chrysler will notify owners, and dealers will replace the passenger frontal air bag inflator, free of charge. The recall is expected to begin February 28, 2018. Owners may contact Chrysler customer service at 1-800-853-1403. Chrysler's number for this recall is U03. Chrysler is recalling certain model year 2013 Dodge Challenger vehicles manufactured from December 3, 2012, through January 24, 2013 and equipped with a V6 engine. The battery positive cable at the starter motor may experience an electrical short circuit to ground. A short circuit could lead to a vehicle fire. Chrysler has begun notifying owners and they are being advised to immediately refrain from driving their vehicles and to contact their dealers. Chrysler Group further advises affected owners not to park their vehicles in, or near, any structures. Dealers will replace the under hood starter cable assembly, free of charge. The recall notification began on March 20, 2013. Owners may contact Chrysler at 1-800-247-9753.